← Regency Nursing TLC Program Officially Launched! The Heart of Regency Nursing! Posted on September 9, 2012	by Judah Gutwein, L.N.H.A. Did you ever have a miserable experience with a huge conglomerate? Did you try to find someone to hold accountable for your happiness, only to be met by a wall of indifference cloaked in layers upon layers of an endless hierarchy leading to nowhere? There are unfortunately far too many nursing and rehab organizations whose leadership hide behind the façade of hierarchy as a means of obfuscating their responsibility to the families who fall under their care. This recipe of layers upon layers of red tape and protocol, spells disaster for the families when they seek help and compassion for their loved ones. All of a sudden, they cannot find anyone in a leadership role who can truly respond to them in a meaningful way. Instead, they get bounced back and forth from department to department while being told ‘how important their concerns are’! At Regency Nursing and Rehab Centers across New Jersey, our legendary reputation for our deep and compassionate care is rooted in the singular approach of our founder and president, Mr. David Gross. Mr. Gross has devoted his life to healthcare and to bringing joy and purpose to the lives of each and every resident who falls under his care. As the Regency family has grown in size and scope, his commitment to personalized care has never wavered nor has it diminished. Mr. Gross takes a personal interest in the well being of every resident (and their families) and he is accessible and approachable for anything at all times. It is his philosophy of compassion that has shaped and influenced the Regency commitment to Care and the lives of our residents have been immeasurably enriched as a result. 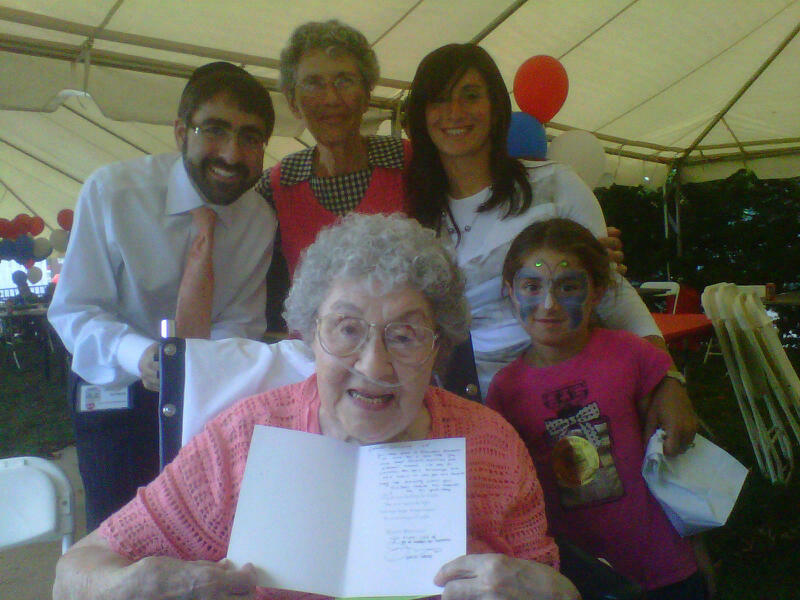 Just today, we are celebrating the 100th birthday of one of our long term residents, Mrs. Gertrude Felden. Mrs. Felden is a resident at the Regency Park Nursing & Rehab facility in Hazlet, N.J.
Mr. Gross himself not only recognized this milestone Birthday, but wrote and signed a personalized Birthday card for Mrs. Felden which he had me hand deliver to her in her room. When I gave Mrs. Felden her card today and she started to read it, she realized who it was from and she literally began to cry! She couldn’t believe that Mr. Gross, who is so busy with so many responsibilities, would take the time out to remember her in this most meaningful way. The ‘heart’ of Regency Nursing truly starts at the top! Mrs. Gertrude Felden showing off her 100 year Birthday card from Mr. Gross. Left To Right: Judah, Pearl, Rochelle and Pessie!